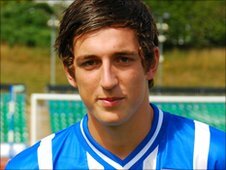 Brighton & Hove Albion defender Lewis Dunk has signed a new contract with the League One leaders. The 19-year-old centre-back has agreed a one-year extension on his previous deal and will now remain with the Seagulls until the summer of 2013. The highly-rated youngster has made five appearances for the first-team this season. He told the club website: "I'm really delighted. To get an extension means that the club really believe in me." He added: "I've now got to work hard in training, try to get myself involved in as many games as I can, and then make sure I take my opportunities in those games." Brighton boss Gus Poyet added: "He has great potential. He is a player that has everything and he can improve and get better."